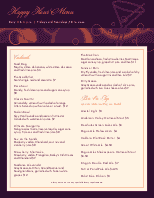 Find a happy hour menu design to promote your happy hour specials and events. These happy hour menus are professionally designed to show off your cocktail and food specials, beer lists, wine offerings and more. From elegant happy hour menu designs to casual happy hour menu looks, we have happy hour menu ideas to drive customer traffic to your bar or restaurant.